Mallory's life is falling apart. When Mallory's parents send her away to a boarding school, she thinks she can escape the gossip and the threats. But someone, or something, has followed her. There's the hand that touches her shoulder when she's drifting off to sleep. A voice whispering her name. And everyone knows what happened. So when a pupil is found dead, Mallory's name is on their lips. Mallory was once a regular girl with a bright future, until she killed a boy. Brian. Brian was the brother of her chemistry partner Dylan. Mallory had always liked the not so single Dylan, so compensated with Brian. He was single and wanted her. But after a terrifying incident the night if a drunken party, Mallory took Brian's life... And she pays with her own every day. Brian's mother is abusive, tormenting Mallory's family, so for her supposed own safety, Mallory is sent to Monroe, a co - education boarding school. The presence still lingers, she can feel the weight of her actions chasing her down. The vivid night terrors, waking up bloodied and bruised, hearing her name whispered. He's here, she can feel him. Mallory is tormented by a group of girls who are he'll bent in driving the last of her sanity right out the window. The resident wanker wants to slither his way into her life, thank goodness she has Reid. Family acquaintances, Reid hasn't seen Mallory in two years, since his father's funeral. The two settle into an easy friendship, Mallory confining in the boy she once almost kissed. But when a student is found dead, in Mallory's room while she slept, will anyone believe that it wasn't her? 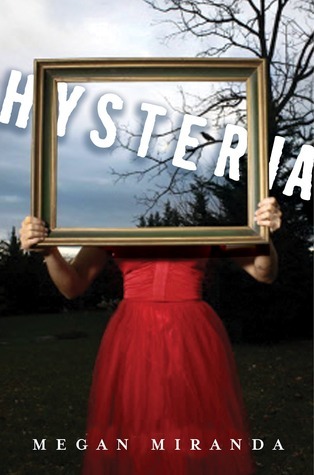 I assumed that Hysteria was a supernatural novel, but it was a young adult contemporary thriller, and pretty entertaining. Mallory isn't a strong character, but she's likable and even seems like a magnet for trouble. She believes that she is mentally unwell, the dreams, the voices, so when she wakes up bruised, she tries to ignore it. As her mother says, if you don't see it... It's not real. Mallory's parents... If they locked her in a dungeon and fed her bread and water, I'd still be of the same opinion. Yes, she killed a boy under duress, but the both emotionally abandoned her. But bad parents aside, it was quite entertaining. It was a light read as you would expect from a young adult novel, but with a few twists and mild suspense, I really enjoyed it.